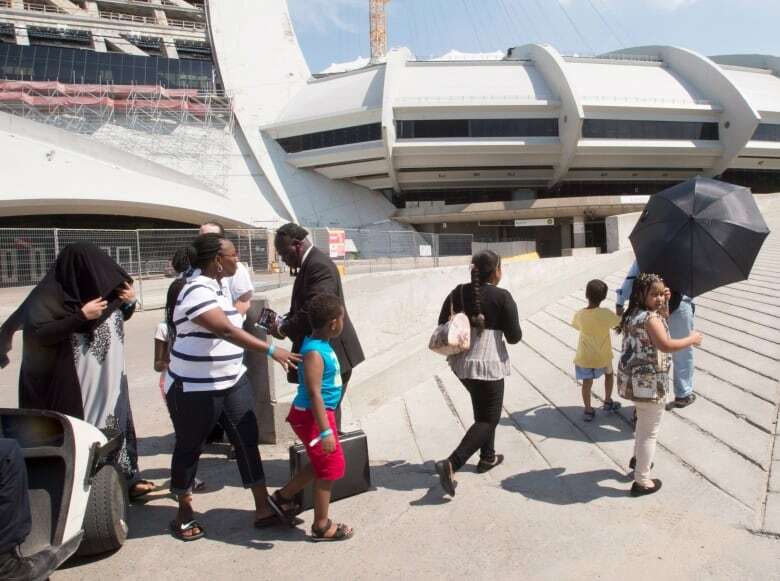 A visit by Haitian government representatives to Montreal as thousands of people from the country seek asylum here is raising alarm among Quebec immigration lawyers. Haiti's Foreign Affairs Minister Antonio Rodrigue and Stéphanie Auguste, the minister for nationals living abroad, met with Mayor Denis Coderre after arriving in Montreal on Tuesday. 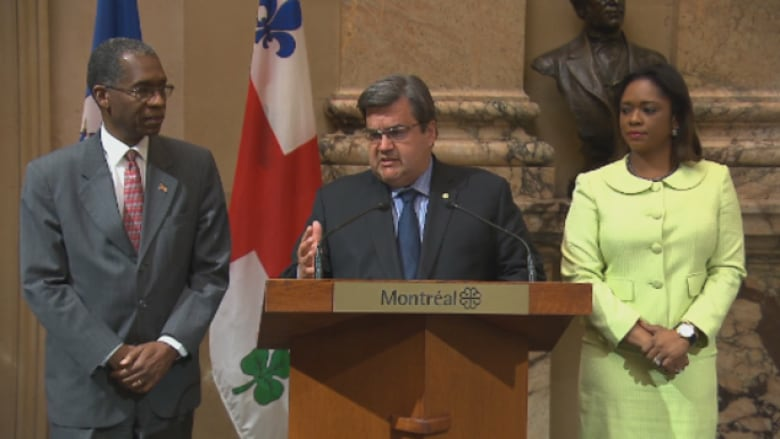 The pair had even hoped to meet with asylum seekers staying at the Olympic Stadium, Rodrigue told a news conference alongside Coderre. In the end, they did not visit the stadium, said a spokesperson for PRAIDA, the provincial organization that assists arrivals to Quebec in their first months. The visit, however, is still cause for concern, said Jean-Sébastien Boudreault, head of the Quebec Association of Immigration Lawyers. He said any contact with the Haitian government could compromise the safety and privacy of those seeking refuge from the country. "We need to make sure, first and foremost, that we are protecting the people we are supposed to be protecting, which are the people who are seeking a refugee status," Boudreau said in an interview. The visit from the Haitian ministers coincided with a surge in asylum seekers from the country. There are 2,620 asylum seekers in temporary housing in Quebec. 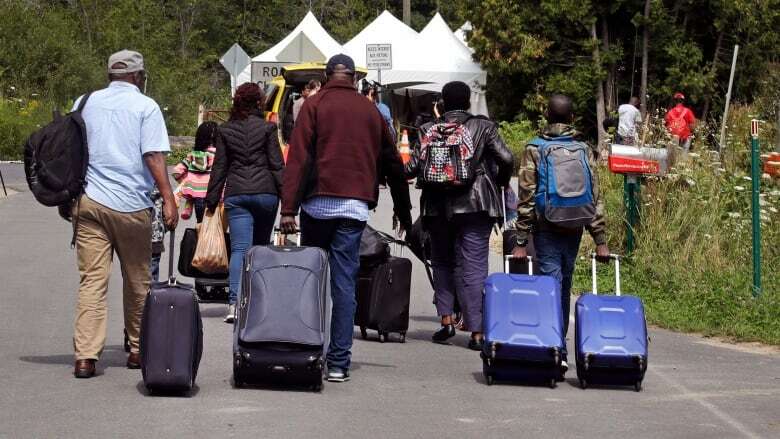 Seventy per cent of those who entered Quebec in recent weeks are of Haitian origin, Quebec Immigration Minister Kathleen Weil said last week. The Canadian military was dispatched to build a camp on Wednesday to provide shelter to the new arrivals as they await processing. At the news conference, Rodrigue tried to downplay the concerns, saying they were only visiting to offer support. Rodrigue told reporters they are on a "fact-finding mission" to learn about the Haitians who came to Canada, and to see what kind of agreement can be reached with the Canadian government. They will also help Haitians without identification get the documents they need in order to access essential services, such as passports and birth certificates, Auguste said. For his part, Coderre said their presence was a sign that the government and Haitian President Jovenel Moïse are "taking the problem seriously." The Haitian ministers were invited to Montreal by Haiti's ambassador to Canada, Coderre said. The federal government learned of the ministers' visit two days before they arrived, a spokesperson for Global Affairs Canada said. In a statement, Immigration, Refugees and Citizenship Canada said it will protect "the personal information of all asylum seekers." "No information on individual cases has been shared with the Haitian ministers," the statement said. Thousands of Haitian nationals continue to cross illegally into Quebec in the hopes of making a refugee claim. To be successful, a claimant must demonstrate he or she has a legitimate fear of persecution, war or other violence in their country of origin. Many of them are likely to see their claim rejected, Boudreau said. "You have to have personal reasons not to be sent back," he said. "I am afraid that a lot of them will be returned because they do not meet the requirements of refugees."